Stephen was King of the English from 1135 to his death in 1154, as well as Count of Boulogne from 1125 until 1147 and Duke of Normandy from 1135 until 1144. Stephen's reign was marked by the Anarchy, a civil war with his cousin and rival, the Empress Matilda. 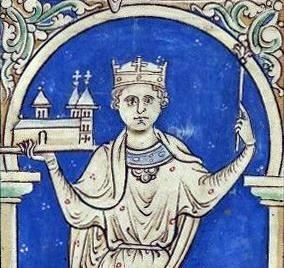 he early years of Stephen's reign were largely successful, despite a series of attacks on his possessions in England and Normandy by David I of Scotland, Welsh rebels, and the Empress Matilda's husband, Geoffrey of Anjou. In 1138 the Empress's half-brother Robert of Gloucester rebelled against Stephen, threatening civil war. Together with his close advisor, Waleran de Beaumont, Stephen took firm steps to defend his rule, including arresting a powerful family of bishops. When the Empress and Robert invaded in 1139, however, Stephen was unable to crush the revolt rapidly, and it took hold in the south-west of England. The war dragged on for many years, before a peace was signed in 1153. Stephen died the following year. He was succeeded by Matilda's son, Henry II, the first of the Angevin kings.